In March this year, the BNP Paribas Open CEO Raymond Moore made a statement on women’s tennis – and then he apologized and resigned. “When I come back in my next life I want to be someone in the WTA because they ride on the coattails of the men,” said Moore. “They don’t make any decisions and they are lucky. They are very, very lucky. While commenting on the issue, Novak Djokovic got into trouble by saying that men should “fight for more” money because their matches have more spectators than those played by women. He then went on to say that women should “absolutely” be paid more – if ladies’ tennis became more popular and lucrative than the game on the men’s side. Needless to say, Novak dropped a few notches in the popularity charts after this frank expression of his views. And therein lies the crux of the problem with women’s tennis today. Spectators line up to watch Serena Williams play. Love her or hate her (and there seems no middle path for fans here), everyone who follows tennis will admit that she stands tall as a giant in women’s tennis, and no one in the past two decades has quite dominated the sport as she has. If there is no Serena playing, the number of spectators drops off dramatically. The money is the wrong argument. Of course women should get paid as much as men, because they put in just as much effort. The real underlying issue is the lack of talent that’s coming into the women’s game. There is no one who challenges Serena with any degree of regularity throughout the year, when she should clearly be at least as much under pressure as the legendary Roger Federer is on the men’s circuit. After all, he is of the same vintage. Instead, at the age of 34, Serena is expected to win every time she steps on the court. And she pretty much does. She has been ranked No.1 in the world for three successive years, and with a huge lead in points, it’s most likely she will end 2016 in the same position. This would be the 6th season she ends up at the No.1 position. Only Navratilova with 7 seasons at the peak has a better record. It’s also a sad reflection on the state of women’s tennis. Navratilova achieved this feat by the time she was 30 years old, and if Serena is to match her, she will be nearly 36 when it happens. In no competitive sports, least of all tennis, is that a reflection of normalcy. Billy Jean King was a giant of her time. She founded the WTA and in 1973 won the famous “Battle of the Sexes” against Bobby Riggs. That changed women’s tennis forever. But King was all business once the match started, and she beat Riggs in straight sets before an estimated television audience of 50 million viewers. But even in this age when she dominated, there was always consistent competition and able challengers. Margaret Court, Virginia Wade and Evonne Goolagong were hard competitors to beat, and most of King’s successes were on grass. Chris Evert took over from Billie Jean King as the dominant force in women’s tennis. She reached 34 grand slam singles finals, more than any other player in professional tennis history. She reached the semis or better in 52 of the 56 grand slams she played, including at least the semis in 24 consecutive grand slams between the 1971 US Open and the 1983 French Open. Her win percentage in singles matches was almost 90 per cent, the highest for any tennis player in the Open Era. That’s just a mind-boggling achievement. But even Christ Evert, arguably the greatest women’s player to ever step on a tennis court, always had strong competition snapping at her heels. In fact, she had a 37-43 losing record against Martina Navratilova and 6-8 against Steffi Graf in the twilight of her career, despite her unbelievable career stats. Finally, there was Steffi Graf. Ranked No.1 by WTA for 377 consecutive weeks – something no other man or woman has ever matched – and along with Margaret Court, the only players (male or female) to win three grand slams in a year five times. She was also the only player in tennis history to do the golden slam in a single calendar year – win all four grand slams as well as the Olympics gold medal, which she did in 1988. But she had stiff competition as well, despite her dominance. Martina Navratilova, Lindsay Davenport, Martina Hingis, Monica Seles, Arantxa Sanchez Vicario, were all consistently posing a challenge in every tournament through Graff’s career, and beating her regularly. And now on to the present. There has never quite been a period in women’s tennis when the talent cupboard has been quite so bare. Serena Williams stands alone. And that’s not a good thing for tennis. Maria Sharapova’s career for all practical purposes is over after a 2-year ban for taking a banned substance. The current World No.2 Garbine Muruguza won the French Open in 2016, then promptly got knocked early in Wimbledon. World No.3 Agnieszka Radwanska (popularly known as “The Professor” among her fellow players) is Poland’s favourite daughter and the WTA Fan Favourite Player for five consecutive years since 2011. But she has never won a Grand Slam event, and has just exited early from Wimbledon 2016. World No. 4 Angelique Kerber of Germany has been on the circuit for 10 years and won her first grand slam in Melbourne earlier this year. Her track record does not inspire confidence that she is going to be dominating the women’s circuit anytime soon. 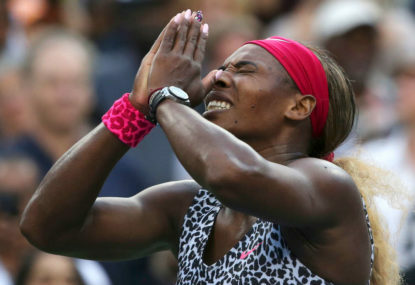 Every time there is an ‘upset’ in women’s tennis with someone beating the Top 5 (which itself changes with alarming regularity), or someone finally manages to beat Serena when she is having a bad day at the office, speculation erupts over the online and social media about whether this is finally someone breaking out of the pack to be the new leader. This has been going on for a few years now. Not a single player has however shown that their promise can become reality. Serena can perhaps carry on for another 3-4 years (after all Navratilova won titles into her 40s), but if no new Evert or Graf or Navratilova or Serena comes through the ranks soon, equal pay will be the least of the problems for women’s tennis. It will be a question of survival. Existential questions will be asked – Should there even be a year-ending WTA tournament? Should there be a women’s singles event at Wimbledon? Will women’s tennis get any sponsors? Something needs to give. And fast. Billy Jean King, are you listening?